Never before have I been sent on such an important mission, but last week was finally my time – and I had the most amazing week of my life! 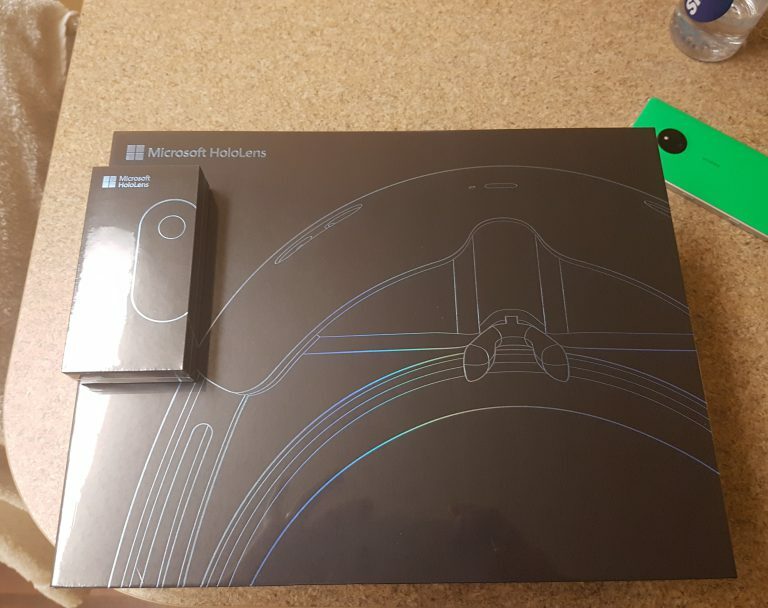 I was shipped off to Seattle on a 3-day adventure to learn about the Microsoft HoloLens – which officially launched on Wednesday (12/Oct) in Ireland. 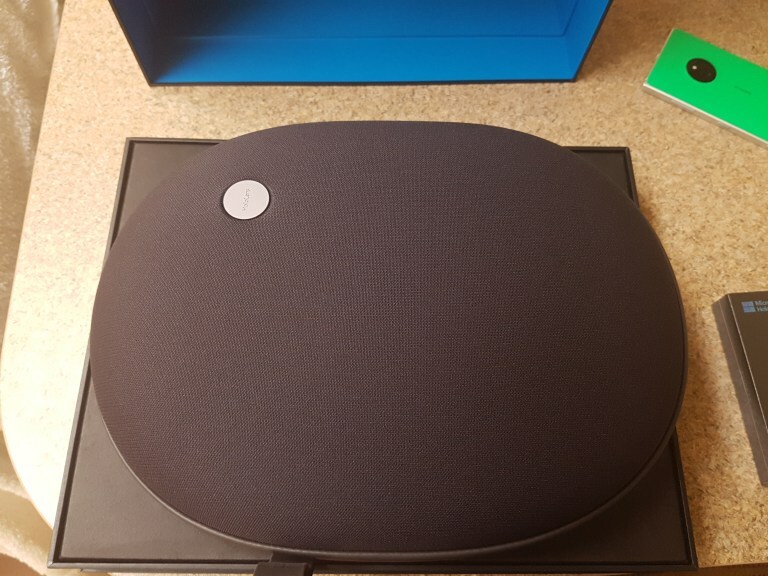 This post will detail my experience with the device, what comes in the box, and how you can get started today! On 12th October 2016, Microsoft announced an International rollout for the HoloLens – and Ireland is one of the countries where it will be available. This means now you can get your hands on one just like I have – check out the details here or pre-order your device here. For those of you who may not know, the Microsoft HoloLens is the first fully self-contained, holographic computer, enabling you to interact with high‑definition holograms in your world [source]. In my own words, it’s totally awesome and I feel like I’ve been living in the future for the past week and a half. I remember growing up watching movies where there were these interactive holograms – and now, it’s real – like mind-blowingly real! On day one, we were taken to a workshop where the team has several rooms set up for defined scenarios. The rooms are designed to get the best experience of the HoloLens – and boy did they work! We got to see five different demos, which I’ve highlighted below. Skype. A woman took me through a scenario where I needed to replace a light switch in my apartment. She was able to see what I was looking at through the camera of my HoloLens and guide me through the replacement remotely. In the end, I replaced the switch, and didn’t even electrocute myself! Destination Mars. A group of us got to experience this trip to Mars. We got to walk on Mars, learn from Buzz Aldrin, and even see the Curiosity Rover in action. Check the video at the link for some information as to how this experience was created. Volvo Cars. Three of us had the opportunity to walk through an experience where we got to learn about the features of the S90 and then design one on our own. Unfortunately the car was NOT in my driveway when I got home! Autodesk Maya. This was a pretty cool demo where I got to experience the HoloLens integrating with a PC running Autodesk. We were designing a motorcycle in Autodesk, then got to see it in real life and work with it on the desk using the mouse and keyboard. The finale was when we overlaid the hologram on top of a real motorcycle in the room to change the colors, shape, and size. It looked so sweet I wanted to ride off with it! 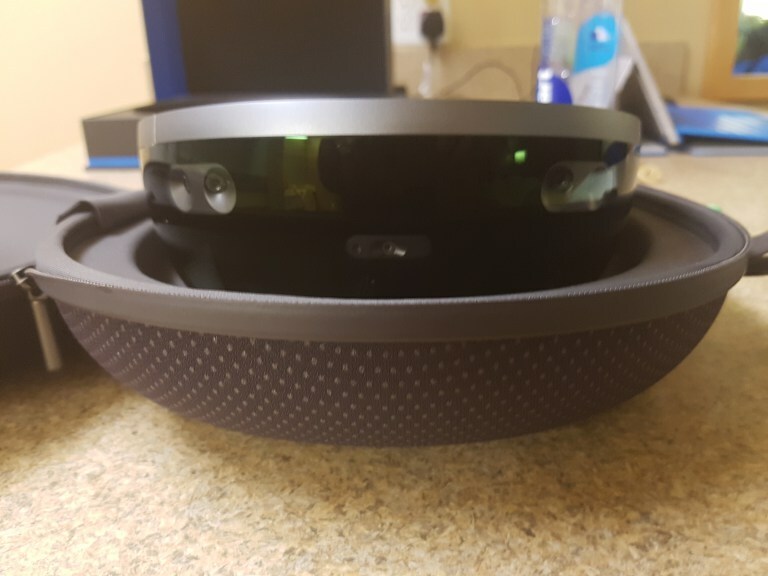 The team was kind enough to provide me with a brand new HoloLens to take back to Ireland, to develop on, and use within the office for demos and customer engagements. Because I’m a super-nerd, I obviously took pictures when I was opening it. From the box with blue metallic writing down to the USB power cord wrapped ever so neatly, everything is extremely well thought out. You can find a full breakdown of what’s included, as well as the price here. When you bring a new device and OS to market, it’s a great idea to have a place to bring people to code and learn to use the device. The HoloLens Academy in Redmond is exactly that. The team designed and built the most amazing lab I have ever seen in my life. 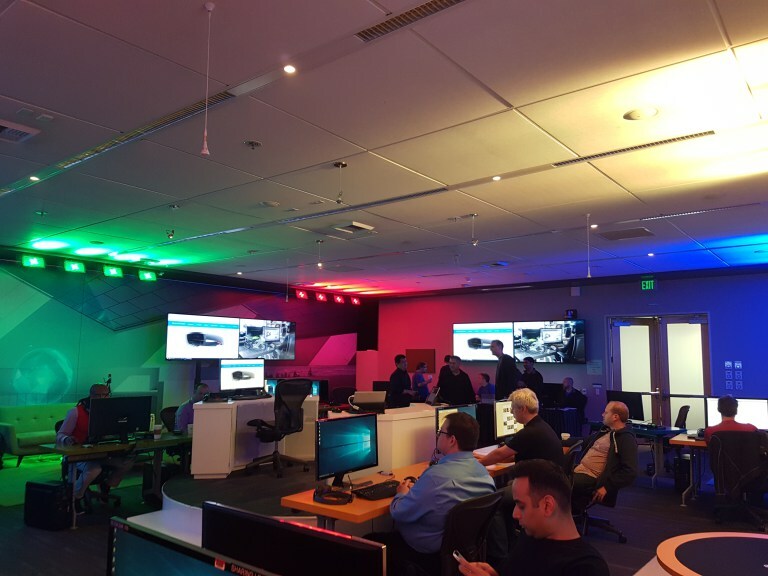 There are enough workstations for roughly 30 people, couches and tables to help emulate a living room environment, massive screens on the walls for demos, super cool lighting, and a hub at the center for the team to run the guided labs. I was absolutely blown away! 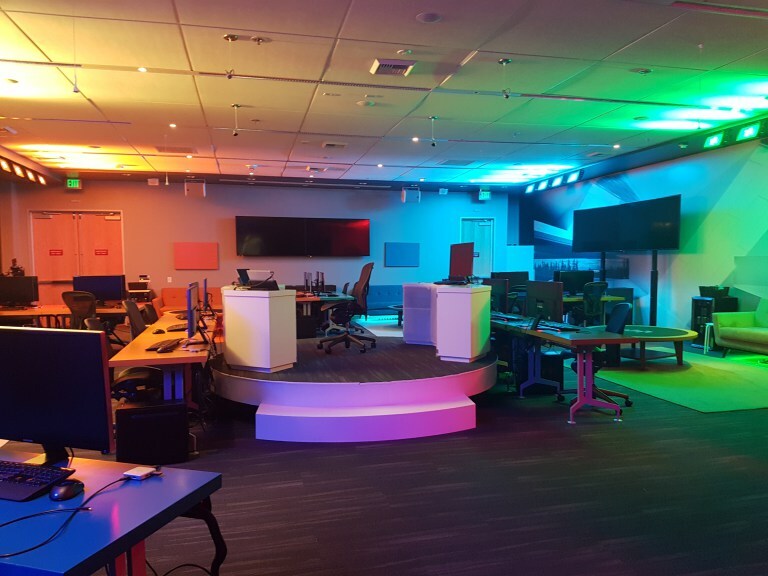 Below are a few pics of the room, where we spent the majority of the week getting hands on experience with the HoloLens and Windows Holographic. 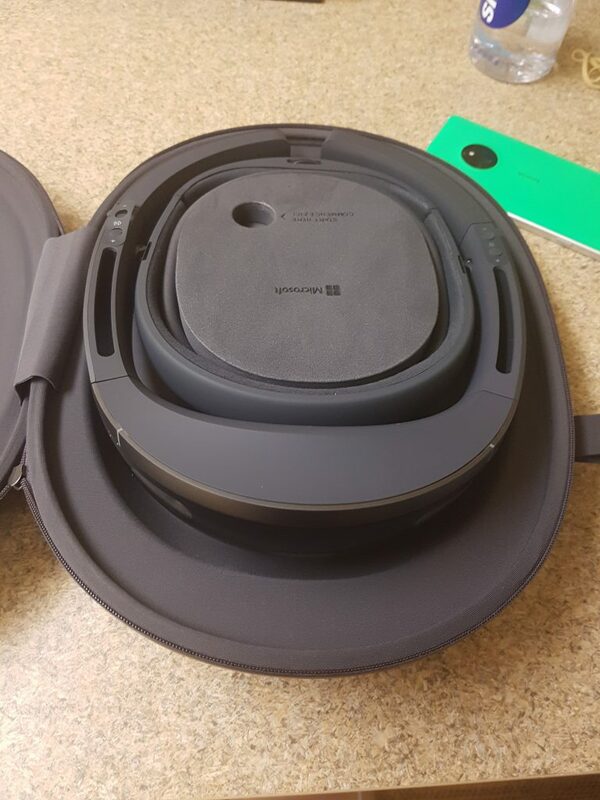 Below is a quick video I took from inside the HoloLens to show you what we created. The video doesn’t exactly do the experience justice – but it’s still pretty cool to give you an idea of how the project came together. During the remaining hack time, I went through a few of the other labs available online, as well as the Universal Windows Platform app samples page on GitHub. When digging through the samples, I came across the Holographic face tracking sample. While this device is not targeted at the consumer market – my family still seemed to get a kick out of it. I set up the HoloLens for each of them and took them through the following apps and games already available on the device through the Windows Store. Even my grandparents had a great experience – and they’re in their 80s! HoloTour: With HoloTour, you can explore the beauty and history of Rome or uncover the hidden secrets of Machu Picchu. RoboRaid: Defend your home from a robot invasion in this mixed reality first-person shooter. Land of Dinosaurs: Jump through a portal and enter a time warp to 65 million years ago when giant creatures ruled the earth. The winner for the younger folks in my family was RoboRaid by far! For my parents and grandparents, you should have heard them as they talked about visiting Rome and Peru after the experience, like they were actually there. Overall, I had an absolutely fantastic week while I was in Redmond – but I also learned a bunch too. Below are some of my key insights. Mixed Reality (MR) is different from Augmented Reality (AR) and Virtual Reality (VR) because Mixed Reality integrates the real and digital worlds, and enhances the experience with holograms. In MR, the computer can see and identify the world around it to enable interaction with holograms. Virtual reality is a computer simulated version of reality, and Augmented Reality is when data and notifications are overlaid in the real world. Check out the developer center and labsavailable online for a great way to get started. You don’t even need your own HoloLens, as you can download the emulators and use with Visual Studio 2015 Community edition for free! 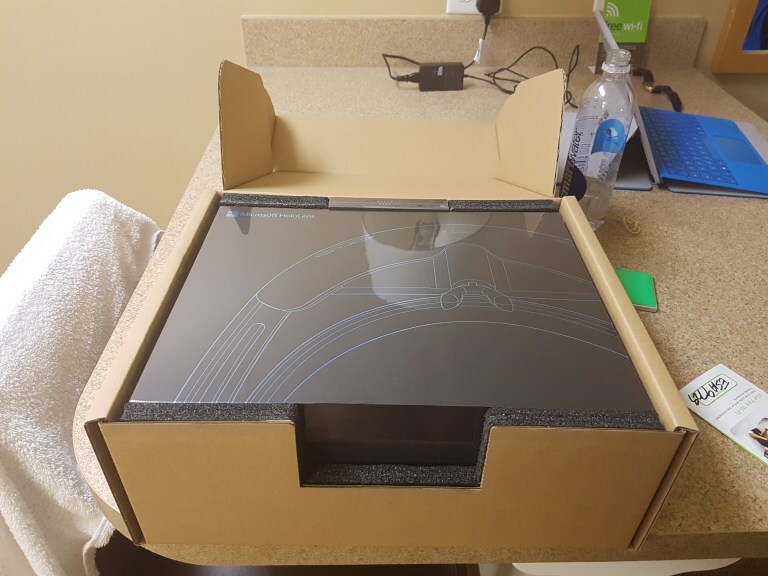 While consumers can purchase the HoloLens, and I did show you some cool games – the focus of this device is currently developers and the enterprise market. Check out some awesome stories from partners already working with the Microsoft HoloLens on the YouTube channel dedicated to Partner Spotlights here. I know I said it before, but I really feel like I’ve been living in the future for the past week. Please let me know if you have any questions in the comments below or on Twitter @mesch13 – and I’ll do my best to answer. Unfortunately, I don’t have time or capacity to give every single one of you a demo – but let’s talk if you have a team interested in building something incredible. Note: I am a Microsoft employee and this post contains my opinions. I am not a member of the HoloLens team.